The local road racing scene broke new ground yesterday with a morning of “speedway” action at the Singapore Turf Club, but it was familiar names in the winner’s circle as Riyadh Hakim (Team Awano Treknology) continued his run of recent success by triumphing in the Men’s Open contest and Chelsie Tan (BikeLabz Racing) followed up her success at last week’s URA-CFS Crit with victory in the Women’s Open race. 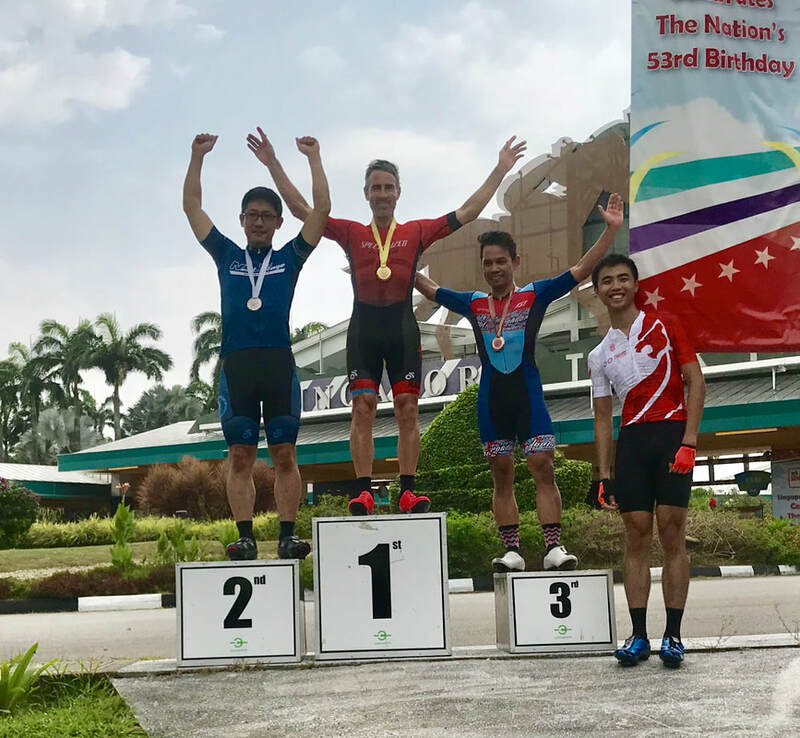 While the bureaucratic and logistical hurdles that prevent proper racing on Singapore’s roads have been well documented, hard work and creative thinking by the major stakeholders in the sport over the past two years have resulted in a string of successful short-course events that are helping to fuel the growth of competitive cycling here. Thanks to the efforts of GetActive, SportsSG, the Singapore Cycling Federation and events firm Cycosports, access was granted by the Turf Club to the concrete safety track that runs inside Singapore’s grand horse-racing course. Oval shaped, well-surfaced and 1.7km in length, it proved to an excellent circuit for some short, sharp speedway action. Due to the test nature of what was termed a “pop-up” event, registration numbers were limited, but the program still included separate races for Men’s Open, Men’s Super Masters, Men’s Masters, Juniors, Women’s Open and Mixed Duo. The format for all the individual races was four laps of the track, while the Mixed Duo pairs rode three laps each. The track was relatively narrow so the starters were capped at 12 per race. All the categories were straight finals except the Men’s Open, which featured three heats, with the first four from each of those qualifiers moving forward to the final. As the procedures for the event meant that all riders, officials, volunteers and supporters had to enter and leave the arena en masse, a captive crowd was present for each of the nine rounds of racing, and with most of Singapore’s cycling clubs/racing teams represented, a real community vibe prevailed. The weather played kind too, with some cloud cover keeping the temperatures down yet not yielding any rain. After the Men’s Open heats had been completed, which were a mixture of all-out blasts and cagey tactical affairs, it was time for the medal rounds, with the Juniors (17-18 years) first up. The field contained the best of the local youngsters, including 2018 double national champion Jie Yu Moh (TWC Racing), but it was his teammate Shu Long Lim who emerged as the victor after the four laps of fast racing. Next on track was the Women’s Open race, which proved to be a much more cagey affair than the Juniors contest, with the entire field staying together for the first three laps. The race exploded into life on the last lap, though, and as the leaders approached the final turn, a five-way sprint for glory unfolded. Chelsie Tan proved to have the strongest legs of the five, although only just, with her margin over the runner-up Ashley Jenna Lui (Team Cycleworx) a mere tenth of a second. Chawaree Termtanan (Guerciotti Racing Team) rounded out the podium in third place. “I really like this place. The course is amazing. I would like for us to come back here and I would love it if we could have more regular races like this in Singapore,” Tan said. The Masters race (35-44 years) was dominated by the team from MatadorRacing and while they did deliver the win, they had to earn it. Having four men in a small field meant the Matadors could constantly attack, and this they did, but Ruairi Brown (Specialized Roval Mavericks) and Marcus Hancock (Integrated Riding Racing Team) were up for the task, and that pair were the only riders still with the Matador quarter when the bell sounded for the last lap. Perfect tactics on that last trip around the 1.7km circuit saw Romain Barbier drop off sprint specialist Kelvin Khoo into the lead on the home stretch, and the Matador man duly finished it off in a time of 9 minutes 14.77 seconds, making it the fastest race of the day by a considerable margin. Brown was half a bike length back in second, with Hancock coming through for third. The Men’s Open final contained a quality field, with any of the 12 names on the start list capable of winning the race. Cagey was gain the key word for the opening two laps, but approaching the first turn on lap #3 Junaidi Hashim (Team Awano Treknology) put down the hammer on the outside of the track and powered away from the bunch. Such was the venom in the attack that Junaidi had a lead of some 15 seconds at the bell, and with the bunch all looking at each other when they came past the crowd, it looked like a shoo in for Team Awano leader. However, with a headwind in the back stretch and an at-last motivated pack led by an almighty pull from Lance Tan, the gap began to dwindle. Riyadh exuded calm as he talked post race. “I think it was a tactical battle today. It wasn’t really a fast race from the start until the second last lap when Junaidi made his breakaway, and nobody wanted to do the work, so we just did the tactical game. But in the end we still caught him around the 500 metres mark. Then Bastian went all out from there and I just followed his wheel and then sprinted out for the last 100 metres. Asked if he would have expected to beat big name sprinters like Elyas and Tan, young Riyadh answered quite modestly. “I just feel like I took the chance well I guess, followed the right wheel and made the most out it,” he said. The youngster is returning to his preferred trails for some cross country racing in KL late this month, before coming back to Singapore for Jungle Cross III on August 28. “Maybe, maybe,” he said with a smile as his Awano teammates egged him on. The occasion was an undoubted success and the revelation post-race that negotiations are going well to secure more access to the Turf Club track was received very well. The only negative to come from the morning was the non-attendance of a fair number of the registered competitors. Due to the test nature of the event, limited spots were available for each of the race categories, and they were snapped up quickly. The no-shows therefore prevented others from enjoying the speedway experience. 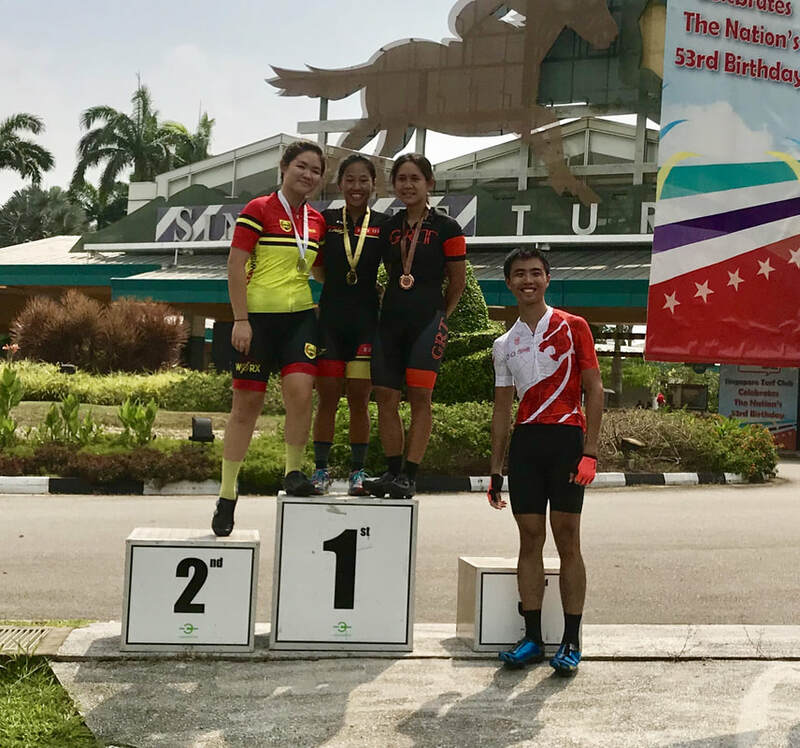 For full results of the GetActive Singapore Cycling Challenge click on the Cycosports results page.